From Searcy and beyond, Arkansas has a lot of outdoors to be explored. Living in the “Natural State” presents students with an array of outdoor activity options. Greers Ferry Lake, a one-hour drive from campus, is a great place to get on the water. The Little Red River is the perfect spot to fish. Take a hike up on Pinnacle Mountain in Little Rock or Sugarloaf Mountain in Heber Springs to be refreshed and challenged. Sometimes enjoying nature means simply looking up and appreciating the beauty around you. Junior Madeline Adkins makes spending time outside a priority in her schedule. Adkins has spent two summers working as a mountain guide in Colorado with Wilderness Expeditions. Through this experience she has learned valuable lessons about the basics of setting up camp in the wilderness. These basic survival skills are key when going on an extensive hike. For Adkins, spending time in nature is a survival skill in itself. 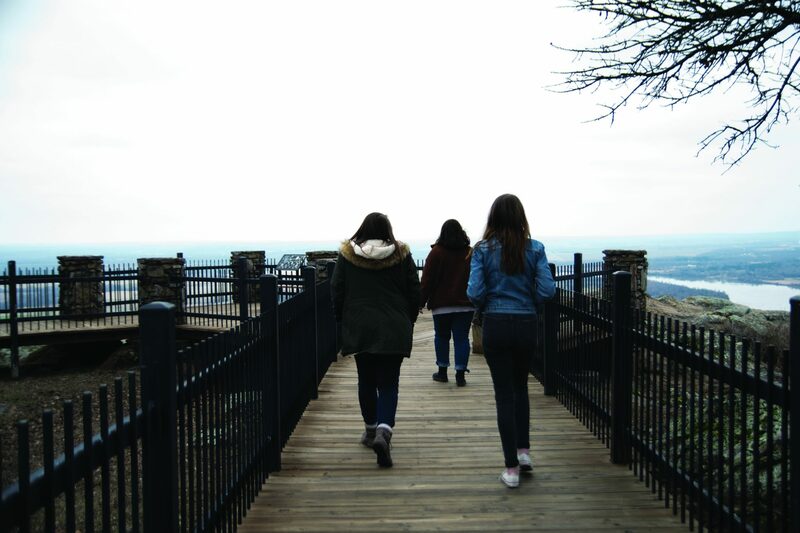 Harding provides students with many opportunities to explore Arkansas while also working to ensure that they are safe. For the students in the Honors College, outdoor gear is available for rent. For overnight camping adventures students must make the school aware of their destination for safety purposes, according to the Harding Residence Life Handbook. Beyond Boundaries Outfitters, an outdoors store in the heart of downtown Searcy, equips people with any gear they might need to adventure. Owner Angela Sivia said that Beyond Boundaries carries camping and hiking gear from brands like Therm-a-Rest, SealLine, and Good To-Go Food. They can also order gear that they do not have in store. “If someone wants to go on a camping trip and needs a certain tent or something come on by, and if we don’t have it in stock, we can order it for you,” Sivia said. The mission of Beyond Boundaries encourages people to “go beyond” what seems possible in order to grow. “I believe that in each of us, there is more than we think there is. It doesn’t matter if you’re young or old, male or female, we all can do more than what we think,” Sivia said. Sivia enjoys running and hiking, and has explored a lot of the state. She said that one of her family’s favorite trails is Sylamore Creek, which connects to Blanchard Springs.